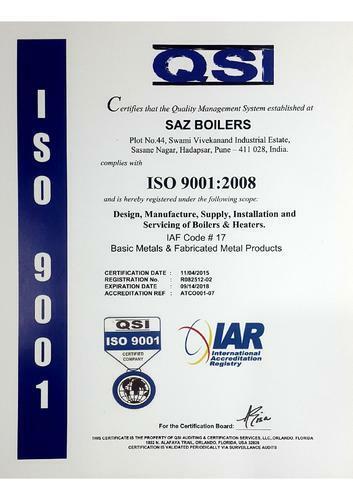 SAZ BOILERS is an 22 years old ISO 9001:2008 Certified Company. We are one of the prominent manufacturer, exporter, and supplier of Steam Boilers, Hot Water Generators, Thermal Fluid Heaters, Hot Air Generators, etc. Our products are developed and designed as per the international quality and norms. They are used in various industrial applications in the sectors like Food Industry, Laundries, Chemical Process, Textile Industries, Oil Refineries, etc. With our rich experience of more than two decades, we have been able to attract a huge number of clients in India as well as abroad. Our clients place repetitive order of the products due to our products and their excellent after sales services right from the selection to commissioning, supply of accessories, spares & pipelines, maintenance & repairs. Consequently, we are considered as one of the credible suppliers of Steam Boilers. Competitive price, quick delivery, excellent performance & prompt sales after service. All equipments are designed, manufactured & tested to achieve maximum efficiency. We offer dimensionally accurate heating equipment that is used in various industrial applications. Our comprehensive product range comprises of the boiler, thermic fluid heaters, hot water/air generators, Heat Recovery Units, water treatment plants, oil/gas burner and other products & services offered. All our products are manufactured using qualitative raw material procured from reliable sources. Being a quality conscious company, we have always tried to make it a point to ensure that total time management takes place and each stage of our production is carefully monitored. We perform pre-production and post-production tests for the products we manufacture. At the very basic phase, we check for the quality of raw materials. We have a well-facilitated lab to perform all the tests and with the help of our team of quality analysts, scientists, and researchers, we are able to achieve the heights of the desired quality. We have a fully equipped R & D team which carries out latest market research to understand the specific requirements of the clients and help us to procure products according to the market requirements which help us to grow in our business. They also assist us in providing better and cost effective after sale service of the products.